It was discovered by NASA’s Mars Reconnaissance Orbiter (NRO), which has been studying the Martian surface for 11 years. 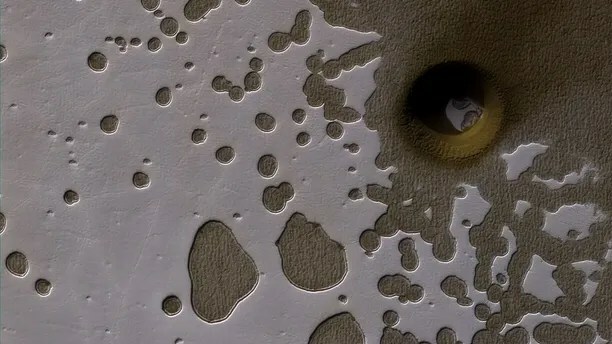 The vast pit, estimated to be hundreds of feet across and surrounded by frozen carbon dioxide, is located on the south pole of Mars— sticking out among the Swiss cheese terrain of Earth’s closest neighbor. According to Science Alert, there are many ways such holes are formed on Mars, which is colder than Earth— meteorites leave craters; lava tubes collapse and produce deep pits; floods from long ago hollow out grand canyons; and volcanos melts ice fashioning funnels. The depression was discovered by the MRO’s High Resolution Imaging Science Experiment, or HiRISE camera, which allows NASA to see Martian objects larger than 3 feet from about 125 to 250 miles above. The camera takes repeated images throughout Mars’ seasons to monitor the terrain’s changes.